Cleaning up and reorganizing my office continues - I'm planning to frame the postcard (from rarrarpress), and the "Training Wheels" Little Red Bicycle mini-skeins are out on display while I decide what to do with them. Display of Cascade 220 Wool at a local craft store today. 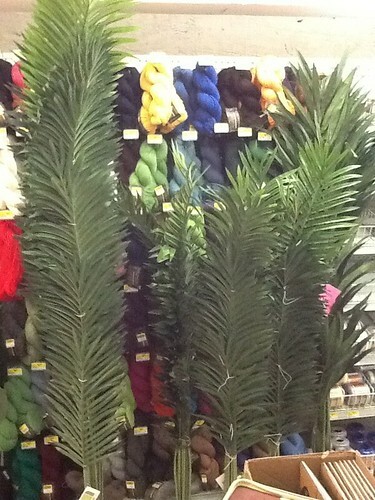 Kirsten Hipsky suggested on Twitter that "the yarn is performing zee forbidden palm-frond fan dance" - ha! I do like the idea that the yarn is being presented seductive and mysterious, but at the moment I was just annoyed because I'd gone to the store specifically to buy Cascade 220 Wool and hadn't planned on having to push my way through a fake jungle to get to it. So back in January, Stephanie Pearl-McPhee blogged about her self-imposed sock club, bundling together yarn from her stash with patterns and setting up 12 grab-and-go bags. I thought it was a nifty idea, and then I forgot about it. After my frog-or-finish decisions, though, I started thinking about it again, because it was time for me to look at my stash and start thinking about what to keep and what to donate/gift/sell. I have a bin for yarnstorming supplies (mostly odds and ends of various yarns, vintage acrylic) and I set up a box of yarns for Mom (kitchen cotton, she likes making dishcloths), and then I stalled. Well. Would you want to give this up? 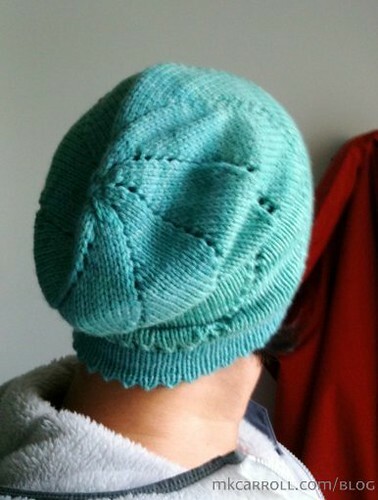 At that point, I went through my Ravelry stash (that helped me figure out how long some yarns had been in my stash) and my favorites, and did some pattern suggestion searches. With that, I started a Ravelry queue and have been bagging yarns together with notecards that have the pattern name and hook/needle size written on them. No printed patterns, because 1) I don't own a printer, and 2) I have been using my Kindle for patterns and really liking it. This is the first bag, which I now have in my portable project bag. I've started the Wham Bam Thank You Lamb cowl by Susan Chang, and it's at just the right speed for winding down from the holidays - garter stitch and quick progress, resulting in a cowl that is very gift-able (that is to say, Muggles will like it). I'm over halfway through after one car ride, and if I knit during the drive back home tonight (I'm not going to be the one driving! 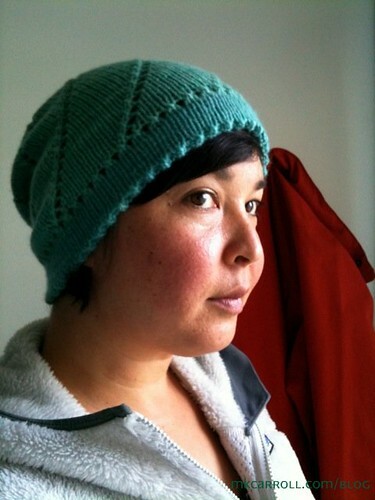 ), I'll be done and ready to cast on for the Cabled Button Toque by Amy Swenson, which I think could coordinate well with the cowl without being too matchy-matchy. 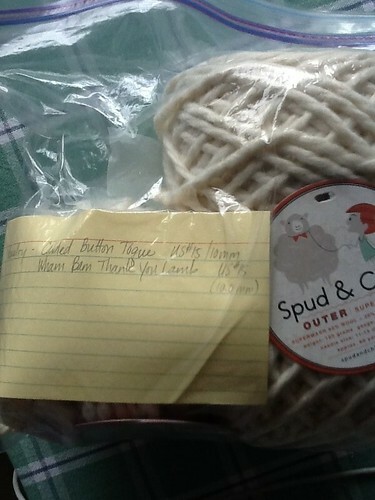 For yarns that I don't have a project in mind for, it's time for my trade/sell list on Ravelry. I don't need any more yarn right now, so it's all sell (unless you have some marvelous handspun yarn to trade). Because I need to move these yarns out of my stash, I'm asking for 10 - 20% below average retail price for untouched skeins that have been sealed in plastic bags away from light and odors, in a pet-free home. As I continue to sort through my stash, more yarns are likely to be added. A few weeks ago, I picked up a skein of locally hand-dyed yarn at YarnStory (Nadezdha's Crayon Box, yarn Ka'a'awa, colorway "Shallow Water" and started swatching with it. Then I thought it would be nice to make a hat and scarf set, bought another skein of the yarn, cast on, and spent most of my spare time for the next two days knitting. 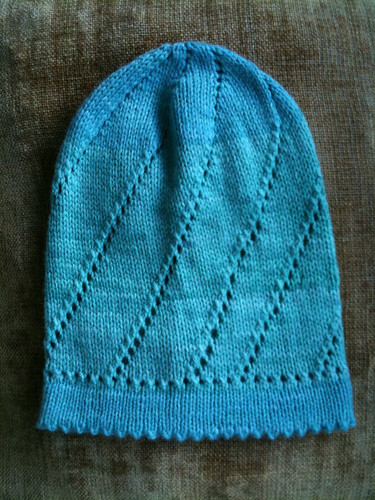 Still no scarf, and this used up most of the yarn. I picked up 2 skeins of Nadezdha's Crayon Box handdyed worsted weight wool yarn at YarnStory and have started swatching for a scarf. 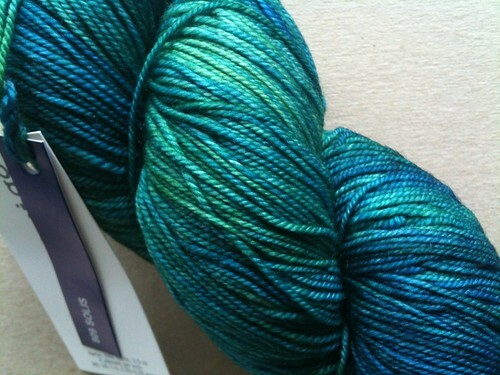 This colorway is "Ka'a'awa", which can be translated as "shallow water" so I was looking for something evocative of that. 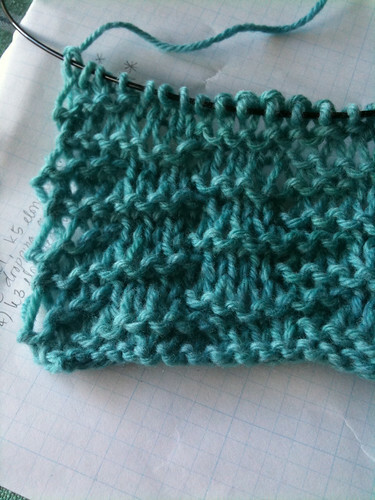 This is called Harrow Stitch in one of the Mon Tricot stitch dictionaries I have on hand, and I think it's working out rather nicely.